Alexis Duque participated in the Under the Influence show in Fall 2016 at Village West. Imaginatively charting the psychological experience of space, Duque produces paintings and drawings of buildings and domestic interiors stacked and conglomerated into trippy, absurd mounds and towers. His compositions are detailed, highly organized, and meticulously architectural. With a psychedelic precision reminiscent of M.C. Escher's, Duque uses perspectival tricks and surrealistic overlapping to render dozens of skyscrapers as a single red tower; or homes, living rooms, train tracks, and alleys as a mass on the verge of collapsing into itself like a black hole. The wheeling bird's-eye view that he often employs recalls the Italian Futurists' soaring imagery of cities as seen from airplanes. Through his playful stacking and piling, he reorders cities to examine the formal properties of their architecture. 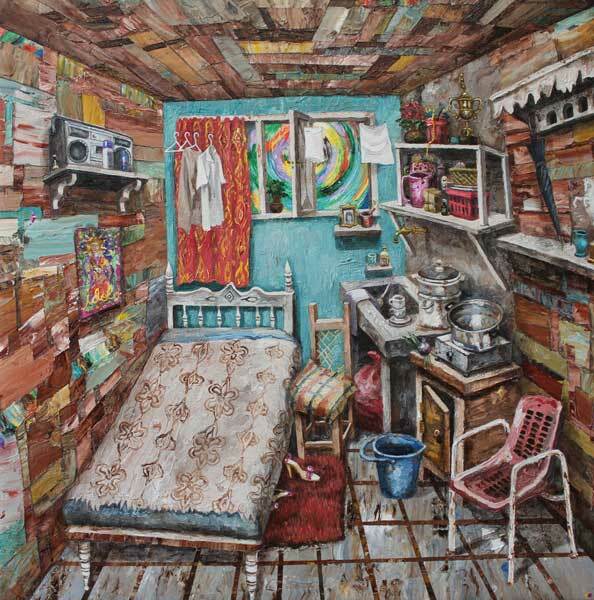 Duque holds a Bachelor of Fine Arts from The University of Antioquia, Colombia. His work has been exhibited in numerous venues including: at El Museo del Barrio, The Drawing Center and Praxis International Gallery in New York; The Museum of Latin American Art (MOLAA), Long Beach, CA; Champion Contemporary, Austin, TX; The Alden B. Dow Museum of Science and Art, Midland, MI; Rudolf V Gallery, Amsterdam, Netherlands and Galleri Oxholm in Copenhagen, Denmark. Duque's work has been featured in several publications, including: "Imagine Architecture: Artistic Visions Of The Urban Realm", "Caribbean: Together Apart Contemporary Artists from (part of) the Caribbean" Imago Mundi - Luciano Benetton, Blue Canvas Magazine, LandEscape Art review, Beautiful Decay, Artistaday, New American Paintings, Studio Visit Magazine, The East Hampton Star, The East Hampton Press and El Diario of New York. Duque currently lives and works in NYC. For more information, please visit www.alexisduque.net.